Public Domain. Suggested credit: Bain/Library of Congress via pingnews. 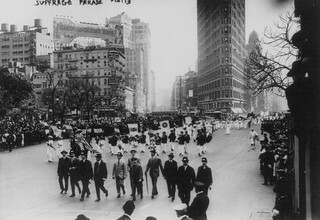 SUMMARY: View towards Flat Iron Bldg., Fifth Ave. and Broadway. LOT subdivision subject: Women's suffrage in the United States - Activities, 1913-1914. Caption card tracings: NY -- NYC -- Bldgs; NY -- NYC -- Misc. ; Woman -- Suffrage -- 1913; Geogr. ; Demonstrations; Women - Suffrage; Shelf.